I am a Walgreens shopper! I enjoy the size of the store, location, products offered and their Balance Rewards program (I earn points which results in saving money). I can visit, grab pretty much everything on my list and get out without fighting a huge crowd. Another thing I enjoy is NASCAR and guess what…NASCAR is teaming up with Walgreens and offering an exclusive Balance Financial Card! This convenient card has so many benefits plus one lucky cardholder will win a mustang (details below)! It’s a win-win scenario for Walgreens and NASCAR fans! Being a mom is a B-U-S-Y job, we juggle so much! The Balance Financial Card is a great way to stay on budget and it’s a safe alternative to cash! Did you know one American household out of four –68 million adults– is unbanked or underbanked. The Balance Financial Card can help prevent this since it’s not your typical card, you can deposit payroll, tax refund and government benefit checks, receive cash back from Walgreen’s cashiers (up to $100), and use the convenient ATM’s located inside Walgreens and Duane Reade. Best part of all, it’s B-I-G on convenience and small on fees. Below are some additional key factors. Safety: Mastercard Zero liability protection. Convenience: Can be reloaded at 8,200+ Walgreens or Duane Reade stores & can be used everywhere Debit MasterCard is accepted (shopping, paying bills and online). Value: No-fee ATM withdrawals at most Walgreens or Duane Reade stores. Rewards: Cardholders earn Balance Rewards points faster just for using their Card (must link Balance Financial Card and Balance Rewards account). 100 points every single time you reload your card in a store. 1,000 points when your first direct deposit is made. Then, 250 points for each month you receive a direct deposit. Someone is going to WIN the ROUSH Stage 3 Mustang featured above! Fans dictated the Mustang’s awesome patriotic themed design, it looks stunning. Consumers can enter between February 23 and October 15, 2014. This multi-faceted campaign will be fueled by fan interaction, and will culminate with the awarding of the grand prize: a fully enhanced ROUSH Stage 3 Mustang! How can you enter? By registering YOUR Balance Financial Card for the promotion, cardholders are automatically entered in the sweepstakes portion of the contest. How can you get MORE entries? Cardholders can earn additional automatic entries (up to 5 per day) by making a purchase or reloading their Balance Financial Card. Throughout the promotion, Roush Fenway Racing drivers Greg Biffle, Ryan Reed, Trevor Bayne and Chris Buescher will drive the mustang from a concluding NASCAR race city to the next making pit stops along the way to meet fans! Keeps your eyes open for the mustang AND make sure to grab YOUR Balance Financial Card so you are entered to win! 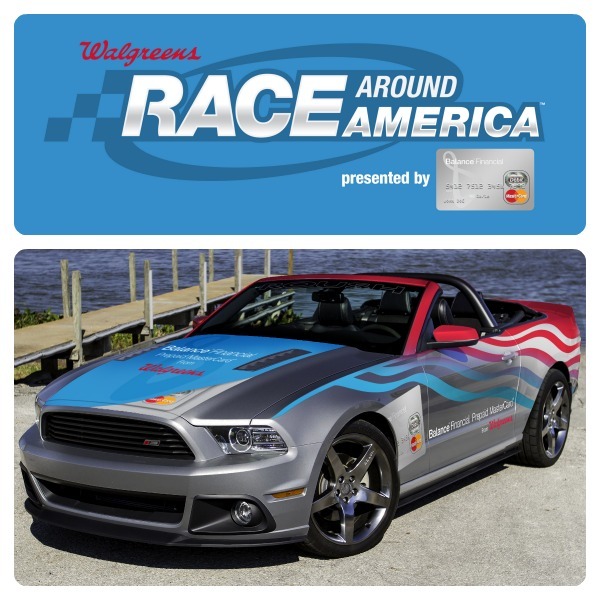 For complete rules and regulations of the Race Around America campaign, visit www.RaceAroundAmerica.com. Stay tuned for more information and giveaways! Disclosure: This is a sponsored post on behalf of Walgreens. All opinions are my own.